Comic Frontline: Kickstart the Week with Moon Girl graphic novel - Retro futurism! Ray guns! Pew Pew! Kickstart the Week with Moon Girl graphic novel - Retro futurism! Ray guns! Pew Pew! Spinning out of the 9-page story starring Moon Girl in The Not Forgotten Anthology, the retro-futuristic world of Moon Girl returns in this brand new standalone graphic novel! I spoke with the creator and writer to learn more about this public domain character. Moon Girl reimagines the public domain character from the 1940s in a PG rated sci-fi adventure. 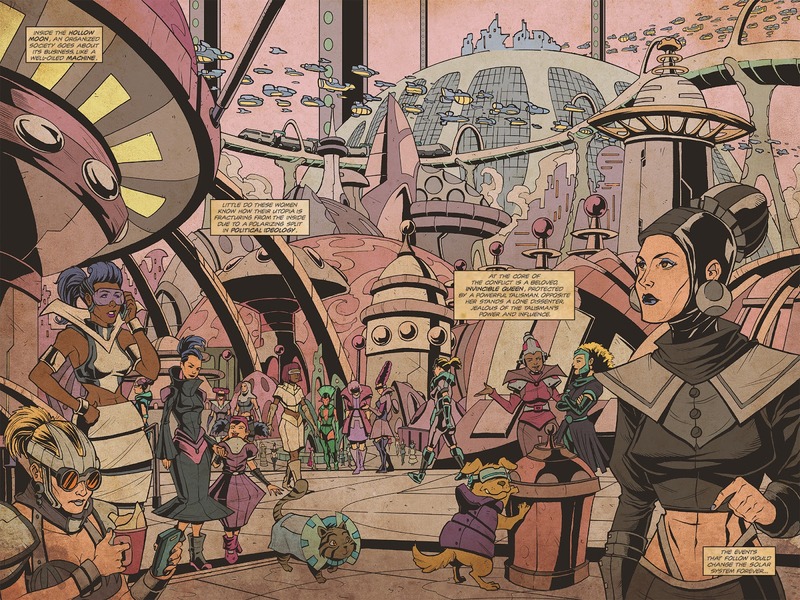 The artwork mimics stained and faded pages, thought bubbles, and ray guns from the golden age comics, combining them with a modern era’s taste for fast pacing. 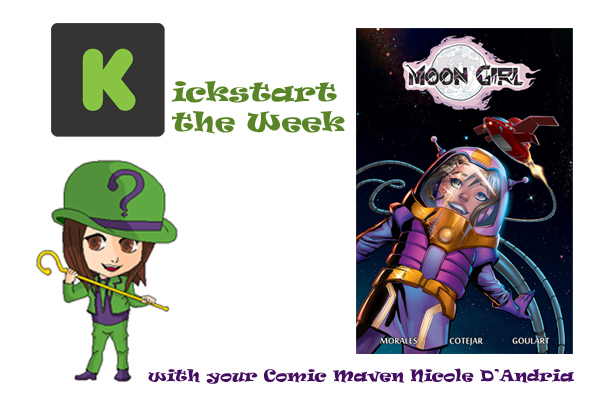 Journey to the moon and experience the life of Moon Girl, who's forced to grow up fast and become a hero. The 80 page graphic novel is created and written by Omar Morales (CruZader). The interior art is illustrated by Joel Cotejar (Star People Adventures) and colored by Paula Goulart. There are also several variant covers available on the Kickstarter by Matt Harding (Ultrasylvania), Molly Satterthwaite and Nicolas Touris (The Fear Diaries). Moon Girl's $4,000 goal needs to be met by December 18, 2018 at 11:48 AM EST for the project to be successful. Rewards include digital ($6) and physical ($12) copies of the graphic novel as well as alternate cover pin-ups (starting at $18). You can even get your own custom Funko of Moon Girl. See the rest of the rewards on the official Kickstarter page for Moon Girl. 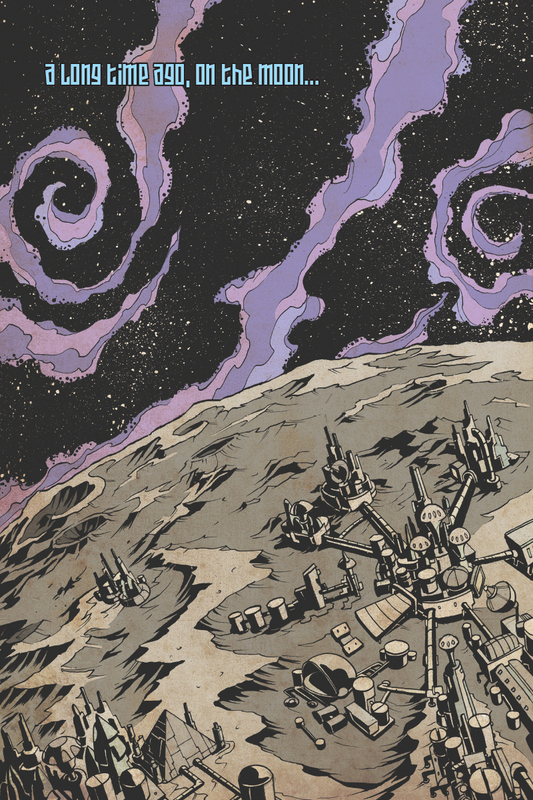 I spoke with creator and writer Omar Morales about his graphic novel Moon Girl. Me: What inspired your initial story featuring Moon Girl in The Not Forgotten Anthology and what made you want to tell more of her story? Morales: What inspired me to re-imagine the story of Moon Girl in Not Forgotten was A) writers had to choose public domain characters for that particular anthology, and B) Moon Girl was such a two-dimensional, generic type of superhero in the 1940s that I felt she deserved to be given new life and a more fully-formed story. 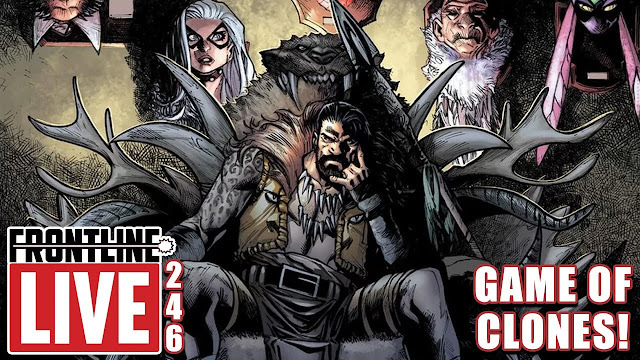 I relished the opportunity to take the bones of her origin, and really put some meat on the bones in a way that still felt golden age, but more satisfying for the modern reader of comics. Me: How would you describe the character of Moon Girl and what inspires her to be a hero? Morales: The character of Moon Girl, in my interpretation, is a little girl when we meet her. She is thrust into life as a hero at a very young age due to some dire circumstances that cause her royal family to flee the moon. Her mother, the queen of the moon, entrusts her with a birth rite at a very early age in a tremendous display of trust and faith. Imagine a young girl's mom dying and the father saying "you're the woman of the house now." It's kind of like that - a young protagonist forced to grow up and take responsibility. Me: Tell us more about the retro-futuristic world in Moon Girl. Morales: The visual for the world of Moon Girl is one that's been in my head for a long time. 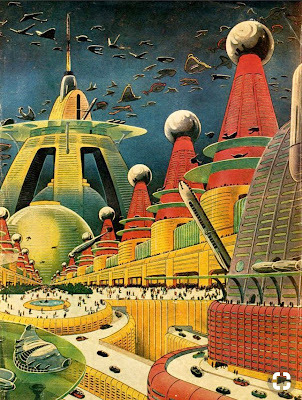 There is an old, pulpy picture of a "city of the future" that captured my imagination long ago. 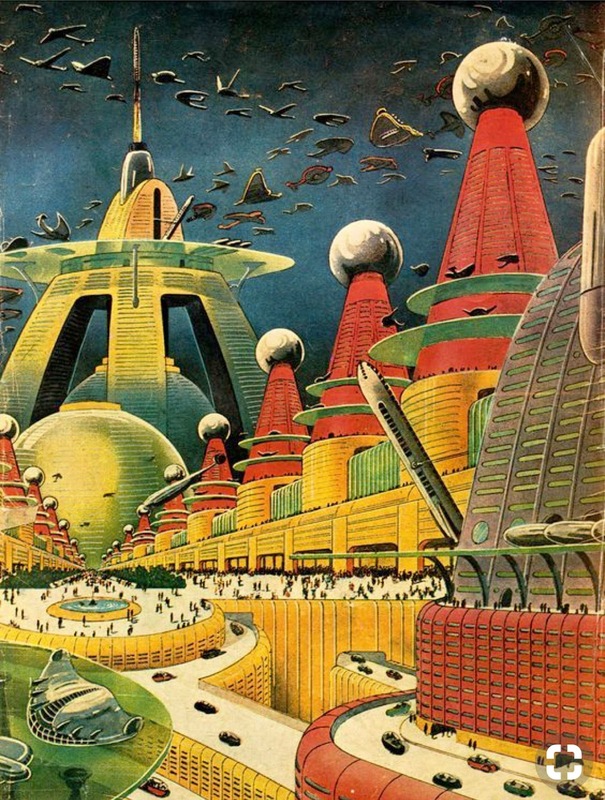 It is classic retro-futurism with flying cars and odd-shaped buildings. When I went to write the story of an ancient race of technologically advanced women living underground on the moon, my mind immediately went to that image of the city of the future. It's a 1940s version of a techno utopia, frozen in time, with ray guns and shiny, metallic clothing. I really dig that aesthetic. Me: Since Moon Girl is a public domain character, are there any plans to bring other public domain characters into the world of Moon Girl? What public domain characters would you add to the universe? Morales: At this point, I have no plans to introduce other public domain characters into my vision of Moon Girl. Essentially, this is a one-and-done complete story arc. I like creating a full story that can stand on its own where a sequel could exist, but it doesn't have to. Plus, my version of the story takes place in ancient history, so there really aren't any opportunities to include other golden age characters. Me: How did you find Joel Cotejar and Paula Goulart and why do you feel they were the perfect fit for this project? Morales: Joel and I have been working together for a long time, like over 10 years. He and I did a graphic novel together called, CruZader: Agent of the Vatican - it funded on Kickstarter 5 years ago. He is a known quantity to me, and that is important. He has great vision for designing vehicles, and costumes, and in the case of Moon Girl, entire cityscapes. Paula was a completely new revelation and discovery for this project. She had been part of a team that pitched for Not Forgotten but was not selected. When I saw the image she colored for the pitch, I knew she was the right person to deliver a classic, golden age look to Joel's art, complete with fading and staining. The pages really do look 80 years old. Both artists are phenomenal. Me: If you could spend a day on the moon, what would you do? Morales: If I could spend a day on the moon, I would hunt for evidence of ancient civilizations and alien technology. I know it is up there! The moon is a fascinating place - it's been there, teasing us forever - so close and yet so far. It contains so many secrets that are yet to be unlocked. Did you know the moon is the EXACT size and EXACT distance away to create a mathematically perfect eclipse? That can't be by accident. I truly believe the moon was manufactured and placed to be a space station, a place where humanity could be observed from a close distance. There is a legend about a dead alien called "the Mona Lisa of the moon," and she makes a brief cameo in Moon Girl. See if you can spot her! Me: What's the number one reason why people should pledge your Kickstarter? Morales: The number one reason people should pledge my Kickstarter is because they love comic books. Moon Girl is made by a comic book fan, for all comic book fans - all ages, all genders, all ethnicities and creeds. It is a retro sci-fi story that includes a wonderful cast of diverse characters. 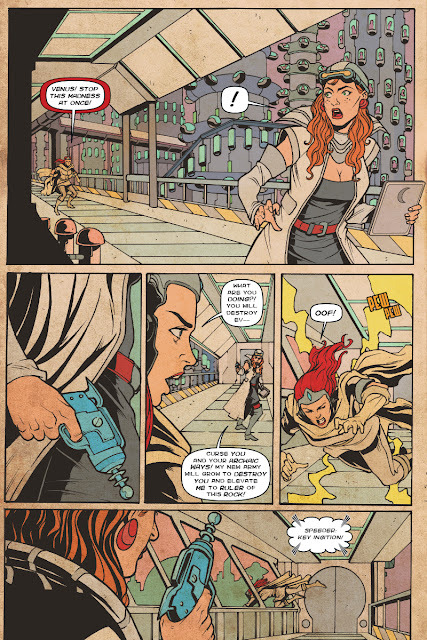 It's fun, fast-paced and features such high-quality artwork by Joel and Paula, and also superstar cover artist Renae De Liz (Legend of Wonder Woman) and letterer Jaymes Reed. Also this: the book is 80% in the can, and will deliver on time. I am not a fly-by-night operation, I take the business of promising and delivering very seriously. Morales: The only advice I'm qualified to give about making comics is this: don't quit! You have to will a comic book into existence. There will be dozens of reasons to quit, dozens of barriers to entry. At the end of the day, you have to want it so bad that you will not take no for an answer. Start slow, start simple. Learn the basics of how to write a comic book script and experiment with short stories, then move on to a 22-page single issue. You'll make mistakes, but you will learn a great deal. Also, write very clear work agreements with artists and pay them fairly and on time. There are no free lunches, so be professional and honor commitments to everyone you deal with. Me: For people interested in writing and publishing stories about public domain characters in particular, what advice would you give them when approaching such material? Morales: In terms of doing public domain characters, which seems to be making a strong comeback these days, do a lot of research. Find characters you like that you can build around. Also research them very thoroughly to make sure they are indeed public domain characters. With Moon Girl, I saw that she was listed all over the internet as a public domain character, but I also searched for a trademark on Moon Girl with the US government and found that indeed there was no trademark for the character or name. Lastly, you have to do your version of the character in a way that does not copy someone else's interpretation. I can do my own Peter Pan story, but it can't be a carbon copy of Disney's Peter Pan - I'd have to put my own twist on it, where it is clearly a unique vision of the character. Me: Thank you for taking the time to bring a golden oldie back to the modern world! If you’re reading this and interested in checking out the Kickstarter, see it here. Super! Returns from the Grave!